Since 2011 Noble Isle has prided itself in providing a modern British brand of skin and home fragrances using ingredients sourced from Britain such as Rhubarb from Yorkshire, Sea Oak from Ireland, Malted Barley and Honey from Scotland, and Beetroot from Wales.. Noble Isle is what was used by Kings & Queens in the 15th Century to describe Britain. Also did I mention the brand is cruelty free! Perfect for upcoming Valentine's day, whether you're in a relationship or single, it's a treat. Having a sensual bath or shower with this Willow Song Gel, there's a masculine but also feminine balance which does make it good for a unisex product. It lathers up beautifully and I've found there's no skin irritations for me with that. Enriched with extracts of willow bark and water lily, these are known for their soothing properties. 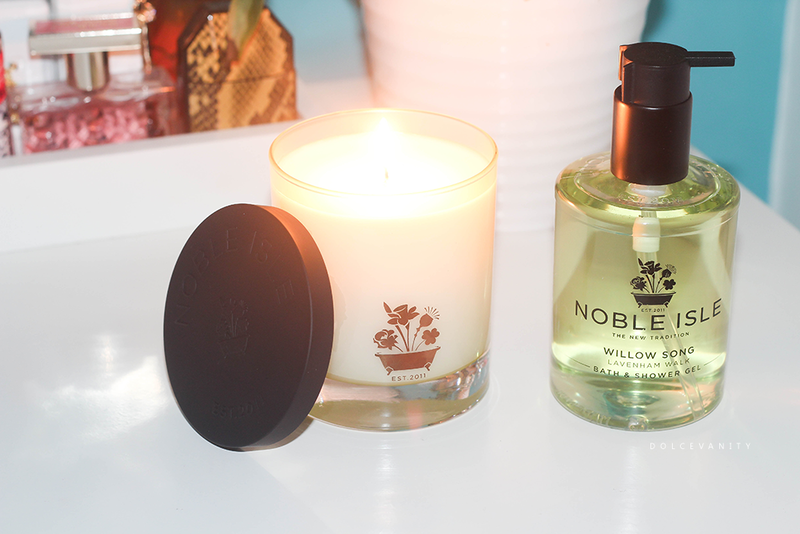 Noble Isle sources water lily and willow from the medieval town of Lavenham. I like that it comes in a pump bottle, making it less fiddly having no with lids or screw tops. Fragrance notes include. Top notes: Rose Petal, Ivy. Heart notes: Watermelon, Lily of the Valley. Base notes: Cedarwood, Musk. Fabulous darling. Another product that compliments the gel is this Candle with Snuffer. Has the same fragrance notes as the bath & shower gel above, it's a single wick candle that comes in a glass and the snuffer wooden top. Either have this in the bathroom to use to relax or have it ready to burn when you come back into your room to relax or help enhance any sensuality. Candles are a big part of my likes, I always need candles around, tea lights, large, medium, small - whatever. I need candles, they instantly make everything feel warmer and more relaxed.